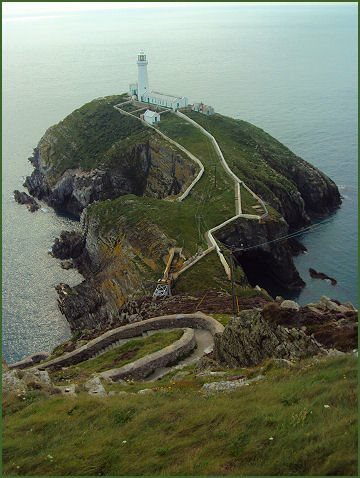 The island of South Stack, known in Welsh as Ynys Lawd is located just off Holy Island on the north west coast of Anglesey. 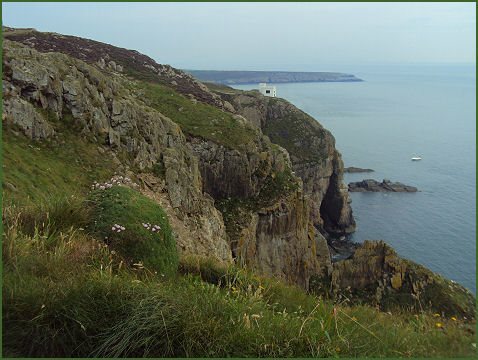 The granite cliffs of South Stack abound with bird life, each summer 4,000 birds visit the area, seals or dolphins have also been spotted from the island. From Ellin's Tower RSPB information centre visitors can watch puffins, fulmars, guillemots, razorbills and peregrine falcons, using binoculars and telescopes, and see live pictures of the birds on the cliffs, gannets diving and newly fledged rare choughs begging food from their parents. The crenellated folly of Ellin's Tower was built in 1868 by Ellin, wife of William Owen Stanley, local MP and later Lord Lieutenant of Anglesey and now serves as a completely refurbished Information Centre with a shop and café, which serves freshly prepared hot and cold dishes. Locally sourced desserts are a speciality. 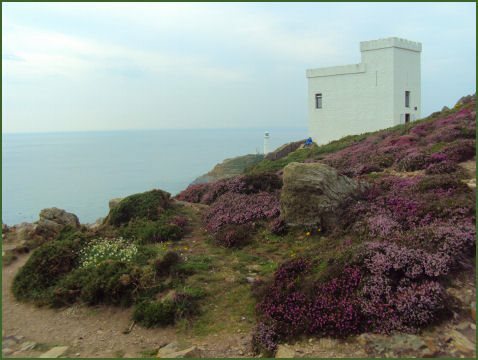 Extensive nature trails provide access to maritime and lowland heathland, along the cliffs and to the top of Holyhead Mountain, and there is disabled and pushchair access to Ellin’s Tower Information Centre and viewpoint. In spring and summer, the heathland has a spectacular carpet of wildflowers which cover the cliff tops, including a yellow flower called spathulate fleawort, which grows only in this area. 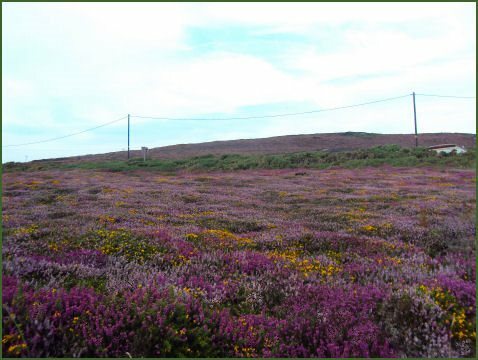 In autumn the heath is ablaze with purple heather and yellow gorse. 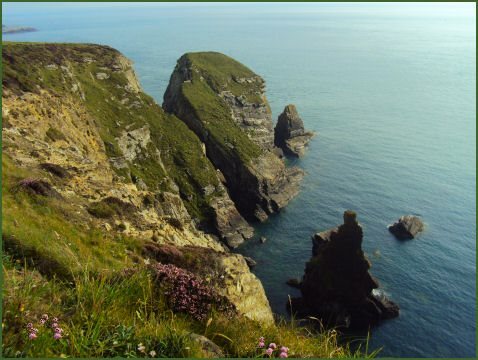 The cliffs contain some of the oldest rocks in Wales, dating back nearly 600 million years to a geological period called the Precambrian. The 30 metre wide channel separating the rock from the cliffs of the headland of Holy Island was originally spanned by an aerial ropeway and later by a rope suspension bridge. The ropeway was replaced in 1828 by an iron suspension bridge, which was in turn superseded by an aluminium truss bridge in 1964. By 1983, however, this had become unsafe and was closed to the public. A new lattice bridge was put in place in 1997 when the island and the lighthouse were opened as a visitor attraction. On a very clear day it is possible to see the Wicklow and Mourne Mountains of Ireland from South Stack and to the north the mountains on the Isle of Man. 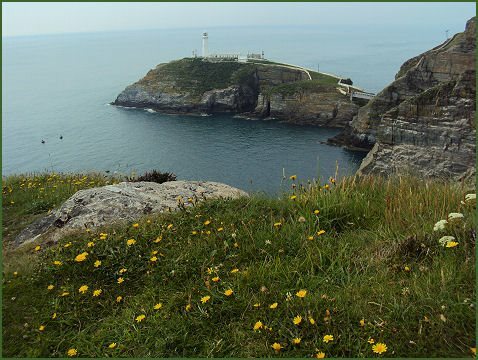 The South Stack Lighthouse, one of Wales' most spectacular lighthouses, was built in 1809. The 28 metre (91 feet) high lighthouse was designed by Daniel Alexander. The main light is visible to passing vessels for 28 miles, and was designed to allow safe passage for ships on the treacherous Dublin - Holyhead - Liverpool sea route. The lighthouse is operated remotely by Trinity House. Visitors can climb to the top of the lighthouse and tour the engine room and exhibitions on the history of the lighthouse. The lighthouse is open seasonally. 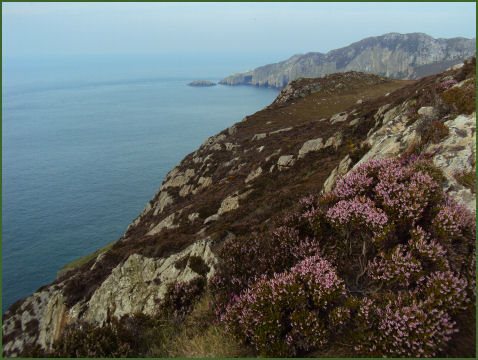 The Anglesey Coastal Path, is a 200-kilometre (124 mile) long distance footpath which follows nearly the entire coastline of Anglesey, passes South Stack. There are also 3 attractive trails which start from near the visitor centre. This 0.3 mile trail commences from the visitor centre, from the corner of the car park, head down a few steep steps to wards Ellin's Tower. Continue to the viewpoint overlooking the lighthouse and cliffs. A 0.6 mile trail which starts at Ellin's Tower car park. Follow the path to the tower, benches are provided to rest and admire the stunning views. A 1.5 mile trail, which takes the same route as the Ellin's Tower trail to the tower, but then heads along the winding clifftop path. After proceeding as far as you wish to, retrace your steps to return to the visitor centre. Take the A55 to Holyhead. On entering the town, go straight across the large roundabout and stay in the left hand lane. Then straight ahead at the lights and take the left turn into town immediately after the Cenotaph monument. Continue up the one-way system (Thomas Street) and take a left turn at the top. This takes you past Holyhead High School and on to South Stack Road. From here follow the Brown signs to South Stack. telephone - 01407 762100 email- south.stack@rspb.org.uk.